Sloth has slipped away from the zoo and is now snoozing in a tree. When some children notice him, they wonder what kind of creature could sleep through any disturbance. After speculating as to who he could be, they finally determine his origins and send him back to where they think he came from. Only trouble is, the kids have failed to see the notices posted by the zoo asking for his return. When sloth finally wakes up, he’s going to be VERY surprised! 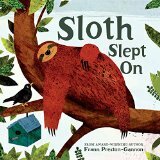 Sloth Slept On is a cute story that introduces sloths to children. Always a favorite at zoos, this unique creature never fails to captivate kids as they watch him sleep soundly in a tree. The twist ending will have kids giggling over the poor sloth’s unusual predicament.